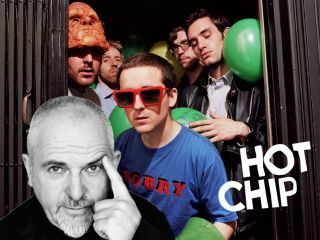 Gabriel and Hot Chip - better than Genesis? Rappers do it all the time - name-check themselves, that is - so why not Peter Gabriel? That's part of the fun of hearing Gabriel team up with the electropop band Hot Chip on a cover of Vampire Weekend's hit, Cape Cod Kwassa Kwassa. Over the summer, Gabriel admitted that he was a fan of the song - he even met with the New York-based Vampire Weekend and remarked that he wouldn't mind doing his own version. He did say, however, that the key line "But this feels unnatural/Peter Gabriel too" might pose some problems. "But this feels unnatural/ Peter Gabriel too/ It feels unnatural to sing your own name"
"I haven't quite worked that out whether I should be doing that or substituting it with a name that might be appropriate to me," he joked. "I think playing with yourself makes you go blind after a while." We're happy to report that both Gabriel's vision and his collaboration with Hot Chip are just fine. Of the track, it's vastly different from Vampire Weekend's Stray Cats-meets-Afro-indie vibe, but it's one of the best things the ex-Genesis singer has done in years. Check out the cut below, and wait for the line "But this feels unnatural/Peter Gabriel too," followed by "It feels unnatural to sing your own name." Great stuff.